Eldest daughter of a poor pharmacist; her mother died when Gemma was seven, her father when the girl was eighteen, and she took over the care of her seven brothers and sisters. Her health was always poor, and between that and her home life she never finished school. Cured in her 20's of spinal meningitis by prayers to the Sacred Heart of Jesus, Saint Gabriel of Our Lady of Sorrows, and Saint Marguerite Marie Alacoque. Rejected by the religious orders to which she applied as they were concerned about her health, would not believe her cure, and were suspicious of the claims of a miracle. She became a Passionist tertiary. Stigmatist, receiving the wounds on her hands and feet each Thursday evening through Friday afternoon starting in June 1899 and continuing into 1901. Visionary; she saw her guardian angel daily, and had visits from Jesus, Mary, Saint Gabriel of Our Lady of Sorrows, and the devil who tempted her to spit on the cross and break a rosary. Venerable Germanus Ruoppolo was her spiritual director and wrote her biography. Born to the Polish nobility, son of Belislaus and Bogna, and raised in a pious family. Educated at Gnesen, Poland, and may have studied at Paris, France. When his parents died, Stanislaus distributed his inheritance to the poor. Parish priest at Czembocz, Poland. Canon and preacher, and later vicar-general at the Cracow cathedral; noted spiritual director. Reluctant bishop of Cracow in 1072. Known for his preaching against sinful living, regardless of the sinner's class. Killed by King Boleslaus the Cruel after Stanislaus excommunicated him due to his war crimes and attempted theft of land from the Church. Murdered while celebrating Mass. Reaction against Boleslaus was so great that he fled the country, never to return; his guilt led him to become a monk. Stanislaus became a symbol of Polish patriotism and nationalism, and is sometimes considered a martyr. Born to the Mercian nobility, the son of Penwald; brother of Saint Pega of Peakirk. Soldier for nine years in the army of King Ethelred of Mercia; the freedom to loot led to him amassing a large forture. However, in 697 he had a conversion experience and gave up the violent life to become a Benedictine monk at Repton under abbess Elfrida. Known for his ascetic and strict habits. Hermit in the Lincolnshire fens, living like the Desert Fathers in an inhospitable swamp area rumoured to be the haunt of monsters and devils; the abbey of Croyland was built on the site of his hermit's cell. Had visions of angels, demons and Saint Batholomew, to whom he had special devotion. Became friends with wild animals, had the gift of prophecy, and his reputation for holines attracted many would-be students including Saint Bettelin. Ordained by Bishop Hedda of Winchester who consecrated Guthlac's cell as a chapel so he could celebrate Mass there. Hermit for 50 years in absolute seclusion near the monastery of Saint Seridon of Gaza, Palestine. Wrote against Origenists. Greatly venerated by the Greeks. Extensive correspondent whose letters have survived 15 centuries. Born to wealthy, pious, aristocratic family, one of six children; only three survived to adulthood. From an early age Helen was devoted to the Holy Spirit. She worked with the Vincentians, caring for the poor and the sick, studying Latin and the writings of the Church Fathers. At age 22 she fell victim to an illness that kept her bed-ridden for eight years, during which time she continued her studies. In 1866 she founded the Society of Mary, Daughters of Saint Agnes in Lucca, Italy and became its first member; the community later became the Oblate Sisters of the Holy Spirit (Sisters of Saint Zita; Zitine Sisters) which cared for and saw to the religious education of girls. Saint Gemma Galgani was one of her students, and the Oblates continue their work today with houses in Italy, Brazil, Canada, Philippines, Lebanon and Iran. Born to the Italian nobility, Antonio studied law at Bologna, Italy, and practised in the Monferrato region of Italy. Elected senator, he abandoned the office and his practice to become a Franciscan monk at Santa Maria del Monte in Genoa, Italy, taking the name Brother Angelo, selling his inheritance and gaving the proceeds to the poor. Noted theologian. Papal nuncio for Pope Sixtus IV and Pope Innocent VIII. Preached a Crusade against invading Turks. Preached against Waldensianism and usurious money lenders. Wrote Cases of Conscience, a dictionary of moral theology. Friend, confessor and spiritual director of Blessed Paula Gambara Costa; her husband received a miraculous cure at the grave site and through the intervention of Father Angelo. Son of Julian and Marianna Lenardt; his father was a locksmith. Franciscan Capuchin friar, entering the community on 3 January 1918, taking the name Antonio; his religious name is later changed to Symforian and makes his final vows on 22 May 1925. He served his community as cook. Arrested for his faith in the Nazi persecutions on 3 September 1941, and sentenced to forced labour at the Auschwitz concentration camp. Martyr. Spiritual student of Saint John the Apostle. Bishop of Pergamum during the persecutions of emperor Domitian. Martyr. Mentioned in the canonical Book of Revelations. Though her parents wanted to arrange a suitable marriage for her, Godeberta was drawn to the religious life. In 657 she became a nun in Noyon, France, receiving the veil from Saint Eligius, to whom she was an advisor. Was given a king's house at Noyon to convert into a convent. Abbess of the nuns in an area surrounded by pagans. Legend says she extinguished a blazing fire by making the Sign of the Cross at it. An outbreak of plague was averted when she led all the churches in the area on a three-day fast. Born a princess, the daughter of King Sancho I of Portugal; sister of Blessed Mafilda and Saint Theresa of Portugal. She devoted herself to charity, supported the Franciscans and Dominicans in Portugal including helping Franciscan missionaries en route to Morocco. 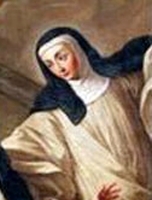 Founded a Cistercian monastery in Coimbra, Portugal where she spent the rest of her life in a cell there. Hermit at Santa Maria della Torre, diocese of Squillace, Calabria, Italy. When Saint Bruno began what became the Carthusians at the Grand Cartreuse in France, Lanunio travelled there to join them. 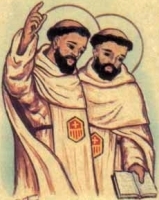 There he became the friend and travelling companion of Saint Bruno, and took over took over leadership of the Order when Bruno died in 1101. Founded several monasteries, and organized the leadership and religious life of their monks. Supported and held in high regard by Pope Paschal II for whom he performed a number of tasks and missions in the region of Calabria. Apostolic Visitor to all monasteries in Calabria. George spent an adventurous youth, travelling to the West Indies with the explorer Sir Francis Drake. He entered the seminary at Douai, France, and was ordained in 1603. Benedictine. From France he returned to England to work with covert Catholics during a suppression of the Church. Martyred for the crime of being a priest. Hermit in a cell near the cathedral of Osnabruck, Germany c.1210. Lived 22 years in his cell wearing a coat of mail and heavy chains next to his skin, praying and counseling those who sought his spiritual guidance. Monk. Fleeing Monophysite persecution, he settled at Monteluco, Umbria where he helped restore the eremitical life to 6th century Italy. Pope Saint Gregory the Great wrote about Isaac's miracle working and his gift of prophecy. One of the 72 disciples sent by Christ in His early ministry. Travelled to Rome, Italy with Saint Peter the Apostle. Missionary to Dalmatia. First bishop of Salona. Martyr with eight soldiers he had brought to the Faith. Benedictine Camaldolese monk-hermit who lived in a cave at Cupramontana, Ancona, Italy on Mount Massaccio. Adult convert, brought to Christianity by witnessing the faith of Blessed Thomas Vives during his martyrdom. Mercedarian friar. Spiritual student of Saint Patrick. Founded a monastery on the isle of Bute, Ireland, served as its first abbot, and led evangelical missions that were based from it. Anchoress in Lappion, Diocese of Laon, France. 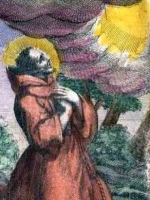 Spiritual student of Saint Eligius. Abbot of Saint Martin's in Tours, France. Abbot at Achard-Finglas, County Carlow, Ireland. Titular saint for a church, a monastery, and several chapels. 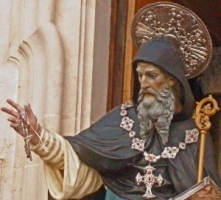 Early bishop of Gortyna, Crete. Wrote and worked against Marcion and Gnosticism. Cistercian abbot. Martyred by Albigensians. Priest in Nicomedia, Asia Minor. Martyred in the persecutions of Diocletian. 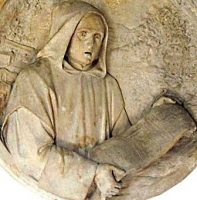 Cistercian monk. Martyred by Albigensians. Sixth century abbot of Clonmore, Ireland.